An excellent buy for those looking for their first compact system camera. Image quality is good, handling is great and there's a good solid system for E Mount cameras. 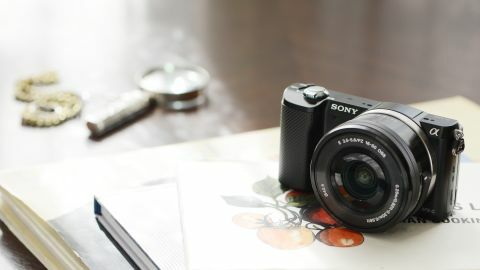 The Sony Alpha A5000 was the fourth compact system camera from Sony to appear after the company decided to drop its NEX name for E-mount cameras. Instead it uses the Alpha brand, often shortened simply to "A". The first model was the Sony a3000, an entry-level camera with a DSLR like design, more akin to the A-mount entry-level Alphas offered by the next company. The next two were the Alpha 7 and Alpha7R, two high-end, full-frame cameras. Sony refreshes its range of compact system cameras, especially those at the lower – middle end of the ranges, roughly every 12 months. The a5000 was announced at CES and is a replacement for the NEX-3N. It sits below the NEX-5T, which is yet to be replaced, and the A6000, the camera which now sits at the top end of Sony's enthusiast APS-C range. Whereas the A7 and A7R are aimed at enthusiast and professional photographers, the a5000 joins the a3000 at the entry-level end of the line-up. This camera however takes the familiar NEX shape we've been used to for some time now, with a flat, compact (body only) design. That's not to say it doesn't feature some of the features from those cameras higher up in the range. Inside the Sony Alpha a5000 is an APS-C format Exmor APS HD CMOS sensor with 20.1 million effective pixels and the same Bionz X processor as found in the A7, A7R and the recently announced A6000. This combination allows sensitivity to be set up to ISO 16,000, but the maximum continuous shooting rate is more modest at just 2.5fps, or 3.5fps in Speed Priority Continuous shooting mode. Although aimed at novices, the Alpha 5000 has advanced exposure modes (program, aperture priority, shutter priority and manual) in addition to iAuto, Superior Auto, Scene selection and Sweep panorama for less experienced photographers. This means that users have room to grow as they learn about the camera. There are also 13 Picture Effects such as High Contrast Monochrome, Toy Camera and HDR Painting that can be applied to JPEG images. Raw files can also be recorded, but not at the same time as using the Picture Effects. There is no viewfinder on the A5000, but the 3-inch 460,000-dot LCD screen is a tilting unit that can be tipped up through 180 degrees to help when shooting selfies. It's worth noting that there is also no hotshoe or accessories port, so you can't add any external accessories to the camera. In addition, NFC and Wi-Fi technology is on-board, with the former allowing quick connections to be made to NFC mobile devices such as Android smartphones and tablets. The Wi-Fi connectivity enables Sony's PlayMemories Camera Apps to be downloaded to the A5000 to add extra functionality. These include options such as Direct Upload that enables images to be uploaded to Facebook, PlayMemories Online or Flickr; Smart Remote Control that enables the camera to be controlled by a phone or tablet; and Time Lapse to enable easy time lapse movie creation. The a5000 is billed as the world's smallest APS-C sized interchangeable lens camera. It's not as small as the tiny Panasonic GM1, but that has a smaller (in comparison to APS-C), Micro Four Thirds sensor. The a5000 competes with other entry-level compact system cameras such as the Samsung NX2000, Panasonic GF6 and Olympus PEN E-PM2.